I wasn't able to put anything on this in the past week but, thanks to my first weekend at home in a month coinciding with knitting group, I managed to get past the ribbing on this, with some cheer-leading from Kat and Jenny who encouraged me to knit it slightly longer instead of slightly shorter than specified. 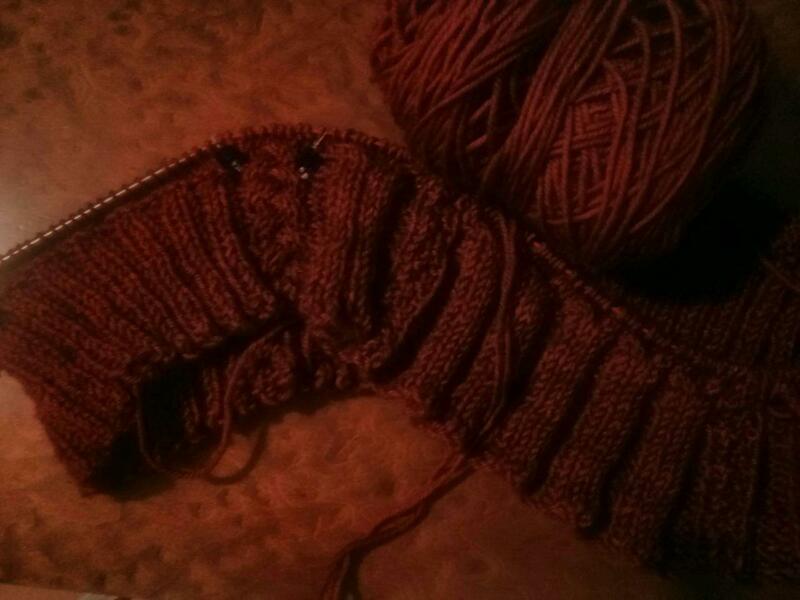 Of course they were correct, but ribbing is really not my favourite thing. Now that I've got all stocking stitch on the back, I am hoping this will go fairly quickly. The cable rows on the front are not too arduous either: more stocking stitch apart from the occasional cable row. I think I like knitting cables so much because I find them very motivating: I am always superkeen to get to the next interesting twist row. The yarn is knitting up beautifully. There's a slight variegation to the colour that you just don't see in the skein. There's also a really lovely sheen to it, that makes it look like it has a bit of silk in there. I'm already excited about visiting the Triskelion stand at the next Wonderwool.